Ahh, Hi-End Gear im edlen Finish von den Machern des Studiostandards „Mutator“. Ein Stereokompressor, der über einen ziemlich einzigartigen Attack/Release Modus verfügt. Dieser ermöglicht schnelle Grobeinstellungen, die dann über Einzelkontrollen justiert werden können. Sonst erinnert die Arbeitsweise an den API 2500, mein persönlicher Liebling auf dem Mixbus. Since 1988 Mutronics have strived to reach the highest standards possible in the studio equipment market. The Mutator first impressed in the mid 1990s and we are always seeking to improve our products and give our customers the best possible results. Our second striking feature is unique to the Impressor. It is the Time Constant control. This enables the user to change the attack and release in relation to each other. It incorporates an RMS detector, which enables the two parameters to be switched in parallel. In addition to these two outstanding features we have added a button state memory to the Impressor lasting at least a week. 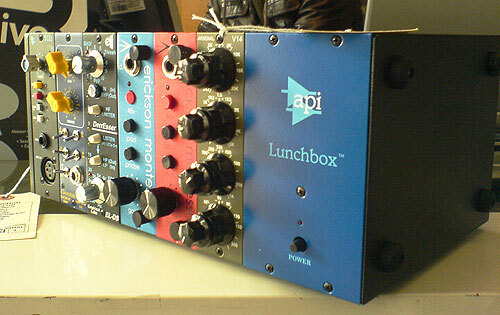 The Impressor is our new dual mono/ stereo switchable VCA compressor. There are a couple of features which set The Impressor apart from the crowd. In The Impressor’s side-chain we‘ve implemented two different operational modes; ‚Feedforward‘ and ‚Feedback‘. ‚Feedforward‘ mode gives a firm, punchy feel akin to compressors such as the Dbx 160, while ‚Feedback‘ mode gives the user opportunity to take a softer vintage approach calling to mind compressors of yore. The second striking feature is, as far as we know, unique to the Impressor. It is the Time Constant control which pertains to The Impressor’s RMS detector circuit. It enables the user to vary attack and release characteristics in a ballpark fashion, which can then be honed with the individual Attack and Release controls. The Impressor represents 2 years of hard labour from our design and field test teams which really does mean World renouned producers and engineers. The Impressor has been out on the road for 12 months and has received praise from some of the world’s top engineers. Its sound quality stands it apart from the crowd, but is very comfortable competing with all comers. Preis: 2000Pfund ohne Steuer, leider. Ok, hier der erste AES-Vorab-Pflichtkauf für Plugin-Jünger: das TG Mastering Pack! Wer weiss, wie toll die Kompressor-Plugins klingen, wird nicht zögern, hier unbesehen zuzuschlagen. The TG Mastering Pack provides authentic emulations of EQ and filter modules from the original EMI TG12410 transfer console. These consoles were custom-built for EMI’s studios and have been the centrepiece of Abbey Road’s mastering rooms for more than 30 years. The TG12410’s Tone Control and Filter modules have become secret weapons of Abbey Road’s mastering engineers and these were studied and modelled to create the TG Mastering Pack. The plug-ins bring the smooth, musical sound of the original TG hardware to users of computer-based audio workstations. The TG12412 is a four-band, semi-parametric EQ with selectable frequencies and curve shapes on each band. The Shape control provides the shelving and variable bell curves from the original module. The TG12414 provides a presence section and low- and high-pass filters. The presence section is the same as the presence EQ on the legendary TG12345 mixing console. Mein persönliches Weihnachtsgeschenkt an mich selbst steht jetzt fest: der Dave Smith Mopho! Das Baby ist so sweet wie Wall-E und viel zu günstig! Bitte schnell vorbestellen, sonst sind erfahrungsgemäß alle weg! 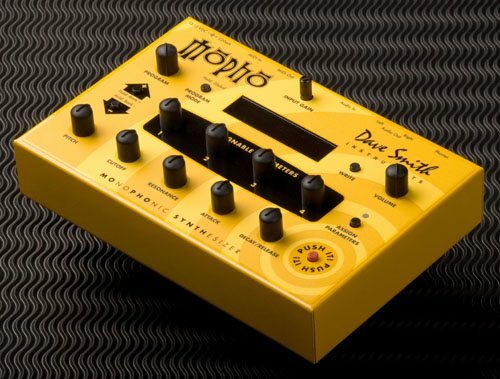 Dave Smith Instruments today announced Mopho, a desktop monophonic analog synthesizer module based on the popular, multiple-award-winning Prophet 08.
can control any of Mopho’s parameters, so the synth is fully programmable from the front panel. Mopho also includes a basic software editor for Mac OS or Windows. Mopho is shipping now and carries a suggested retail price of $439.00. Wenig ist bekannt über das neue Focusrite Saffire 40 Interface, nur dieser Leak einer polnischen Musikseite. Mehr Informationen erfahrt ihr natürlich bald hier. Wowie, SPL könnten einen Preis für größten Marketing-Nonsens im Produktnamen gewinnen: Analog Code Plugins? Please! Aber das beiseite, die Plugins sehen verdammt hot aus und klingen hoffentlich ebenso. Ein Transient-Designer als Plugin ist eine feine Sache – das erste Highlight der AES! SPL of Germany, well-known manufacturer of analog hardware processors, will present their first software plug-ins on the 125th AES Convention in San Francisco. The Transient Designer and a series of EQs mark the start for a new era in SPL’s company history. „We are proud to announce that our software design team has managed to transfer the class and extravaganza of our analog processing technologies into the digital domain.“ says SPL’s CEO Hermann Gier. „We always knew that our analog designs have a big potential in the digital domain. Our greatest advantage is that we have developed some of the industry’s most iconic products. Latest methods for the high-precision modelling of their circuit designs give us results beyond pure mathematical approaches. Our new digital products are so amazingly close to their analog equivalents now that we call them The Analog Code™ plug-ins“. The Transient Designer and a set of three EQs (Vox Ranger, Bass Ranger and Full Ranger, based on the passive graphic equalizers of the SPL RackPack) will be available as RTAS, VST and AU versions. TDM versions are soon to follow. The new SPL Analog Code™ plug-ins debut at the Digidesign 3rd party booth POD 1810. Before the Music dies ist eine schöne Dokumentation über das Musikbusiness, Talent, Plastiktalent, Payola und Arschimplantate, die mit tollen Konzertaufnahmen und guten Interviews glänzt. 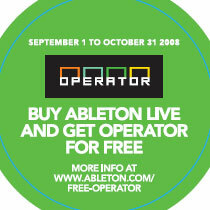 Als gäbe es nicht schon genug Gründe, Ableton Live zu verwenden: wer sich bis zum 31.10. für Live 7 entscheidet, bekommt den wunderbar sägenden Operator-Synth kostenlos dazu! Ein No-Brainer, wie man so schön sagt. Rough Rider is a modern compressor with a bit of „vintage“ style bite and a uniquely warm sound. Perfect for adding compression effects to your drum buss, it also sounds great with synth bass, clean guitar, and backing vocals. Definitely not an all-purpose compressor, Rough Rider is at its best when used to add pump to rhythmic tracks. Of course, you can use it however you‘d like. The Compressor Police aren‘t gonna come to your house and give you a citation. Slap it on a track and crank some knobs. Ausgehtipp Hamburg: Precinct @ Fleetstreet 17.10. Mitte der 80er schrieb Diederichsen, dass einem nirgendwo so sehr wie in New York klar wird, was das hervorstechendste Merkmal der Bewohner Bohemias ist: Sie sind arm. Daran hat sich nach zwanzig Jahren nichts geändert. Und auch nach allen Katastrophen umgibt die Stadt und ihre Kunst die Aura des Ganz-Vorne-Seins, wo sich in den Nischen ungeahnte Kollisionen ereignen. eingebunden sind. In Kollaboration mit Rob Seward, Aleister Kicker, Hugh Swift, Tim Lokiec und Donna Chung entstehen Zeichnungen, Gemälde, Texte und Lieder, die in New York sehnsüchtig als das neue „New“ erwartet werden. Auf ihrem Youtube-Channel könnt ihr das Work in Progress betrachten und auf Myspace Musik hören. Wer in HH ist, kann jedes Wochenende live das Work in Progress betrachten und mit den Jungs feiern. I‘m sorry to report that we won‘t be shipping in 2008 and I can‘t yet offer a new estimated ship date. The good news is that it’s turned into a significantly more powerful and creative product. The bad news is that we‘d prefer not to release details of the new design because it’s so cool that I don‘t want to show our cards to the competition. However, I do want to thank all those who wrote in with suggestions because this interactive design process has very much helped to change what we thought the product originally should be into what we now know you really want. So please hold your questions while we‘re hard at work on it, and I‘ll be periodically updating this page as we release new information. If you‘d like to be notified when we update this page with something significant, please click here to join our LinnDrum II email list. For those of you who are new to LinnDrum II, its new subtitle is „Beat-Centric Digital Audio Workstation with Integrated Analog Synthesis“. 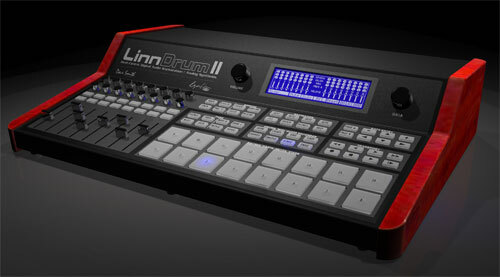 Inspired by how the MPC product line that I (Roger) originally created for Akai has evolved a new genre of musical instrument, LinnDrum II aspires to raise the bar beyond the current crop of high-end pad-oriented music production station products in order to enable musicians around the world to better realize the next wave of beat-oriented music. Ein bischen Angst macht mir der hochtrabende neue Name: ob da versucht wird, die Eierlegendewollmilchsau zu kreieren, die dann viel zu viel kann, um wirklich nutzbar zu sein? Die Spannung steigt in jedem Fall. Youtube ist heute eine Quelle der Freude – Pop goes the Weasel in Pseudo-deutsch, vorgetragen mit voller Körperkomik. Weiss jemand, wie die Pfeife heißt, die Brian Chic verwendet? Panflöten sind schreckliche Instrumente, die mich an Fußgängerzonen mit Max Goldtschen Betonkugeln und schlechtem Speiseeis erinnern. Selbst wenn sie aus köstlichen Karotten geschnitzt wurden, nehme ich umgehend reissaus. Trash, aber lustig: MSN vs. Google Battle Rap. Arsenal Audio by API: its here! Ein Fest für jedes Gearslut-Herz: eine Lunchbox voll mit dem feinsten Equipment, was es derzeit gibt! So auch mit dem neuen Arsenal Audio EQ made by API. Überzeugt euch selbst von der Budget-Reihe von API, die einiges an Sound zu bescheidenen Preisen liefert (545EUR für den EQ, 1099EUR für die Stereo 19″ Variante, 1099EUR für den Dual Mic Pre). Wir haben alle Geräte hier und ihr könnt sie gern 10 Tage kostenlos bei euch daheim testen. Und nicht vergessen: Kauf 4 Module und die Lunchbox ist umsonst! Du browst gerade in den DIGITAL AUDIO SERVICE Weblog-Archiven nach dem Monat September 2008.